OLDRIGHTIE: Is there An Election On Thursday? Is there An Election On Thursday? There was a time when such locations would be adorned with posters for an election, just hours away. I travelled from Ludlow to Stroud today and saw one mega giant UKIP board, one minuscule Green and similarly, Labour front garden ones. So three hours plus on the road and only one major hoarding, for UKIP. Am I alone in believing that there is a dearth of publicity? Or at least posters. If so, is this deliberate? If it both answers are yes, it could be a further monumental piece of arrogance, insomuch the viscious nastines spewing forth, designed to wound UKIP's popularity, makes the anger felt for the Establishment even more aroused. Note the exploitation of language is the only concern for this crowd of cretinous failures who no longer consider they work for us, rather than themselves. The anger Camoron speaks of is regarded as not connected to the nightmare society he and his fellow Common Purpose travellers have wrought upon us all. The abject poverty of many immigrants, the strains on our infrastructure, FGM and other barbaric practices imported. The list of anger inducing, ghastly awfulness, is endless. As for who one gets to live next door, no problems in the Cotswold sanctuaries of the rich and powerful, or the mega rich ghettos of Kensington or Notting Hill. In the rest of the huge housing estates and slums of Haringey or Brum's Small Heath, let alone every other town and City, throughout this blighted Nation, when third world immigrants are scared of Roma neighbours moving in, it's no wonder anger is a consequence of fear. It's only UKIP daring to highlight this state of affairs for which no sane person would ever have voted for. Should UKIP and the rest of Europe not be cheated out of their anger and votes cast are votes counted, for anti-EUSSR feeling, then we might, just might, give the smug and ignorant Establishment of privileged riders on the gravy train, provided by the rest of us, more than a passing fright. 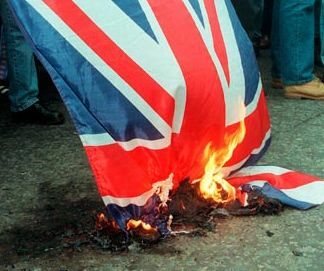 What if the only votes, in a low turnout, are all for expressing this anger, totally misunderstood by Camoron, whilst the LibLabCon vote stays at home? We have but until Sunday to find out. If it goes as most polls are suggesting the complexion of the 2015 election will be altered hugely. The only question may well which which of Labour and Tory will have the most blusher applied. I suspect they might well both have it in equal measure. Time, as ever, will tell! As an aside, have you ever seen Paxman bettered so well as by Farage last evening? If only the others were as human and in tune with the electorate, rather than their Sir Humphrey minders. What's at stake on Thursday.